ASDA JL1206 1300W Travel Hair Dryer - Great reviews - free delivery to store. Got one and its great. The ASDA 1300 watt dual voltage compact travel hairdryer is perfect for use at home or away with its foldable handle, auto safety shut off, concentrator nozzle, removable rear grill and hanging loop. Thanks, back in stock. Just ordered one for the missus, my thatch is long gone. Its only a 79p saving. But then again a deals a deal. Mmmmmmmmmmmmm......... 79p saving. Problem is that u have to shop at ASDA. This hair dryer is terrible. My mom got one. It emits a funky burning smell, takes about three hours to dry hair and if you're lucky you wont get hit by one of the sparks it occasionally fires out. Seriously, AVOID THIS HAIR DRYER LIKE THE PLAGUE!!!!!! This hair dryer is terrible. My mom got one. It emits a funky burning … This hair dryer is terrible. My mom got one. 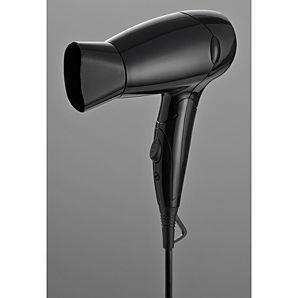 It emits a funky burning smell, takes about three hours to dry hair and if you're lucky you wont get hit by one of the sparks it occasionally fires out.Seriously, AVOID THIS HAIR DRYER LIKE THE PLAGUE!!!!!! you should take it back - i've ha done for a year and use it often and its fine.